Last night was movie night at one of the few remaining drive-in theaters in the area. We went and saw director Tim Burton 's Dark Shadows (2012) starring Johnny Depp, Michelle Pfeiffer, Helena Bonham Carter and Eva Green. I never watched the original Dark Shadows TV series but I am a fan of the revival series from 1991. Tim Burton's version has vampire Barnabas Collins awakened after two hundred years imprisoned in a coffin. The time is 1972 and he rejoins his descendants in their now run down mansion, Collinwood. Barnabas tries to help his family regain some of the importance they once held in the town that holds their family name. His awakening also stirs up the family's archenemy, Angelique, the witch who is still alive and trying to get Barnabas to love her or else she will destroy him and his family. The previews made this out to be an ultra campy, almost purely comedic movie. While the actual movie includes the comedy, camp and liberal use of 70's music, it also includes the atmosphere of the Dark Shadows series as well as the Collins family dynamics and all the other supernatural creatures such as vampires, ghosts, witches and werewolves. The actors did a great job with their characters, including Johnny Depp as Barnabas, Michelle Pfeiffer as the family matriarch Elizabeth and a very delightful and colorful Helena Bonham Carter as Dr. Julia Hoffman. The romance between Barnabas and Victoria Winters seemed almost like an afterthought though. 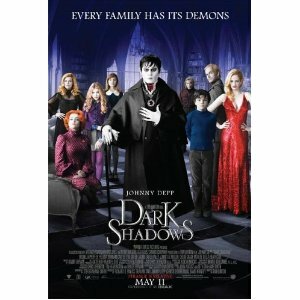 As a whole, I liked this version of Dark Shadows. It's a good addition to the ongoing Dark Shadows saga and I look forward to owning it when it is released on DVD/Blu-ray.